I'm going to be writing more about this for Cycling '74, but I spent some time yesterday trying to come up with a non-laptop performance system centered around the Arturia Beatstep Pro. Now, what you are seeing isn't a perspective problem - it's a tiny computer. 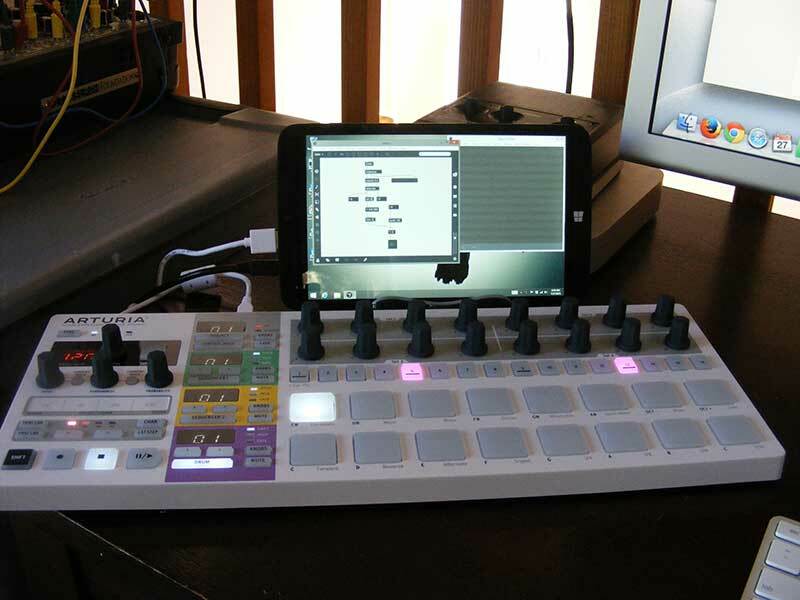 In fact, it's a small tablet running Windows 8.1 - and a Max percussion patch that I'm working on! "Sure," you may say, "you can afford them thar Windows Surface machines!". To which I say "No, this is a Winbook TW802 tablet that I got at Microcenter. My open box unit cost $79, but you can get a new one from them for $99." Produces enough USB power to run the Beatstep Pro, the audio output is good enough to push my mixer, and I now have a backpack-able Max-Beatstep performance rig that actually has a likelihood of being fun! Check out the TW802 at Microcenter, or on Amazon (where it is a lot more expensive).